Special Offers from Discount School Supply®! : 2¢ Shipping Sale On Now! Your two cents just got you a whole lot more at Discount School Supply! For a limited time, pay only 2¢ shipping for select drop ship items. Just 2¢ for shipping? That's an incredible deal! 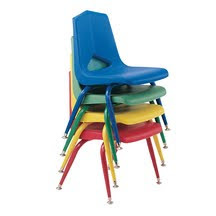 12" Quantum V-Back Plastic Stacking Chair with Matching Legs ONLY $26.95! These super value-priced chairs have a 25-year limited warranty. They are strong, stable, easy to stack and a top-rated Discount School Supply product. 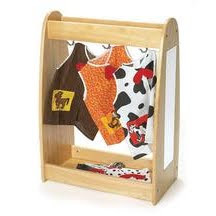 Toddler Book Display ONLY $84.99! Another top-rated Discount School Supply product, this book display is sized just right for toddlers. Deluxe Dress Up Storage Unit ONLY 139.99! This unit is made of rubberwood and features 3 double-sided hooks, storage shelf on top and shatter-proof acrylic mirror. Perfect for your Dramatic Play section! Teachers and caregivers: find more great 2¢ shipping deals by clicking here. But act fast because this amazing deal ends April 12th. And be sure to visit Discount School Supply for all your early childhood classroom essentials. Find great bargains on Arts and Crafts, Furniture, Curriculum Resources, Active Play, Dramatic Play and more every day! Also shop Discount School Supply for products for Infants and Toddlers as well as children with Special Needs. Click here for more!